Michael Shames is a consumer advocate and educator who has headed nonprofit consumer advocacy groups Utility Consumers Action Network and San Diego Consumers' Action Network since 1981. When talking about Pixel smartphones, it's all about the software. That said, using any version of the Pixel requires a bit of effort to delve into its impressive functionality. Most of the tips and tricks discussed below will be found on all the Pixels, not just the newest version. It may not be up to Hubbell pix, but it's no secret Pixel cameras rock. That's because Google is continually upgrading its algorithms and ramping up the AI to create computational photography. Your smartphone gets smarter each time you use the camera based upon previous actions you've taken. Lighting vexes the best photographers, but this function changes all that. By choosing the Night Sight option, you enable the Pixel's HDR+ processing to boost colors and brightness. If the camera detects a dark environment, a pop-up suggestion automatically appears. Night Sight is best used in rooms with dim lighting or evening shots you want to appear to look day-lit. There’s no need to fumble about to launch the camera; Google created Quick Launch to enable one-step photography. You need only double press the power/standby button to quick launch the camera. Go to Settings > System > Gestures, then tap jump to camera to enable it, allowing quick access from any screen. One benefit to buying a Google Pixel phone is Google provides you with free, unlimited, original quality backups of your photos and videos using the Google Photos app. To enable this free backup, open the Photos app and enable backup. It'll be the first prompt you see. Another way to access this feature is in Settings > Google > Backup > Photos & videos. Photobooth: Waits for you to smile or make a funny face before snapping a selfie. Topshot: Takes multiple frames a few seconds before and after you take the shot, then suggests the best one. Playground: Opens an AR sticker feature that inserts characters like Marvel’s Iron Man in pictures of you or your subjects. Super Res Zoom: Allows the user to zoom in on a subject without compromising quality. Motion Auto Focus: Tap a moving subject and the Pixel will automatically track it and keep it in focus. Great for shots of pets and children. One of the cooler AI features is a very powerful real-time voicemail feature. When you receive a call, you're given an option to tap Call Screen. The caller will be asked to say why they’re calling and the answer will be transcribed on your phone in real time. Then, you can choose to take the call, have Google Assistant read one of several pre-set statements, or immediately mark the number as spam. Because this option is set to default, there’s nothing you need to do to enable it, but you can revise it. For example, you can change the voice; tap the three vertical dots at the top right of the phone app to enter the settings, then go to Call Screen > Voice and choose a different voice option. Blue light is not your friend when you're trying to sleep. Most phone manufacturers now offer a blue light filter that can be scheduled to kick in near bedtime. Go to Settings > Display > Night Light, then tap Schedule. From there, you can choose to set a time for blue light to turn on or automatically align it with sunset and sunrise in your area. You may also want to consider including Night Light as part of your Wind Down bedtime routine in Settings > Digital Wellbeing. Android Pie 9.0 introduces a dark mode for the display to help with battery efficiency, and makes the Pixel more readable. The feature can be enabled 24/7, or you can set it so your wallpaper determines the color of the shortcut and notification shade. Go to Settings > Display > Advanced > Device theme, then tap Dark. Google is leading the way in helping people control their smartphone usage by offering an array of digital well-being settings. This function displays the daily or hourly view of the time spent on your phone, how frequently you use different apps, and how many notifications you receive. It also offers tools enabling you to reduce interruptions, set a bedtime schedule, activate blue light, or turn the display to a gray tone. Flip to Shhh is one such tool to check out. As the name suggests, when you place your phone face down it activates a Do Not Disturb status. Go to Settings > Digital Wellbeing to enable Flip to Shhh. This is another one-step process that comes in quite handy. Want to turn on Google Assistant without touching the screen? Use Active Edge. Go to System > Gestures, then tap Active Edge to enable it. Once activated, it opens Google Assistant whenever you squeeze the long sides of the phone, even when the phone is asleep. In the settings, you can choose how hard you need to squeeze the phone, and you can use this same function to silence alarms and timers. Along with the Pixel 3, Google is selling a Pixel Stand. 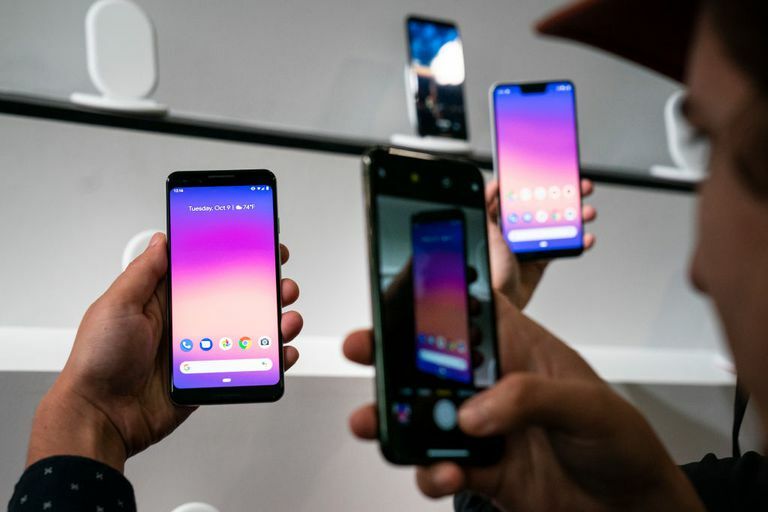 Not only does it offer 10KW wireless charging, it also enables special features on a Pixel 3 to essentially turn it into a smart display. With a Pixel 3, you don’t need a Home Hub or any other smart display – your smartphone becomes a smart display once placed on the Pixel Stand. Wireless charging is unique to the Pixel 3. Pixel Sounds is the audio equivalent of a display app. It offers an enhanced variety of sounds in a bunch of different categories. Access the Sounds app by going to Settings > Sound > Advanced > Default Notification. This allows you to change your ringtone or notification sounds. Remarkably, this useful function comes automatically disabled. One of the first steps after unboxing this phone is to go to Settings > Display > Advanced > Auto-rotate Screen, then toggle the setting to ON. Once enabled, the home screen will display in landscape when held horizontally. If you enjoy having the screen always show the time, date, and weather on your lock screen, you can make that happen with Always On. Head to Settings > Display > Advanced > Ambient Display. Here you'll find the option for the always-on display. One nice touch is you can also include Now Playin, Google’s song ID feature, on the lock screen. You can find this feature under Notifications. You might also consider enabling Double-tap to check phone and Lift to check phone, although either of these options is probably sufficient. Security is strongly enhanced in the new Pixel OS; it now includes convenient secure-unlock options like the fingerprint sensor and Smart Lock. You can go one step further with Lockdown mode, which comes in handy when you're traveling or in an unfamiliar place, as it deactivates certain features to make your phone more secure. To enable Lockdown, go to Settings > Security and Location > Lock screen preferences > Show Lockdown Option, then tap the toggle to enable it; hold the power button and you'll see Lockdown as an option alongside shut down and restart. Lockdown also allows you to temporarily disable the Fingerprint Unlock, Smart Lock, and Notifications on the lock screen. So now, in order to unlock the phone, you’ll need to use either the PIN or a pre-programmed pattern.